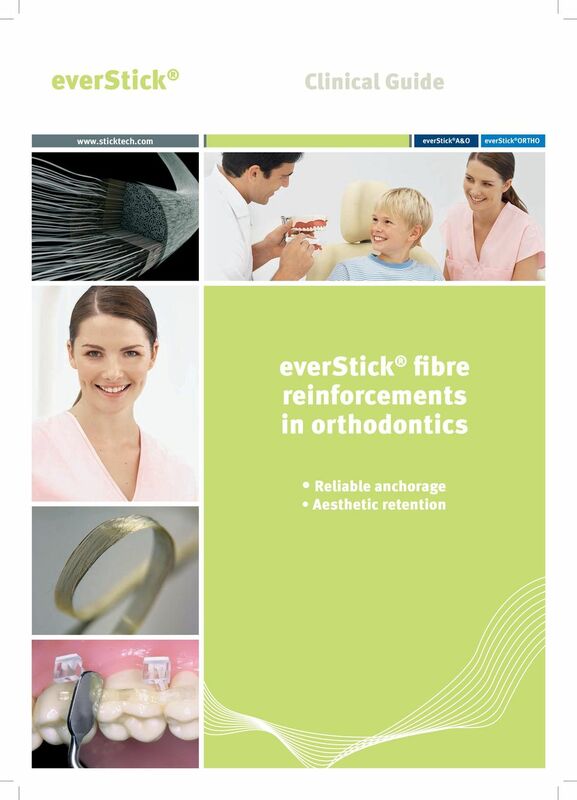 Download "everstick everstick fibre reinforcements in orthodontics Clinical Guide Reliable anchorage Aesthetic retention www.sticktech.com everstick ORTHO"
4 Instructions for use everstick A&O How to build a reliable anchorage with everstick A&O 1. 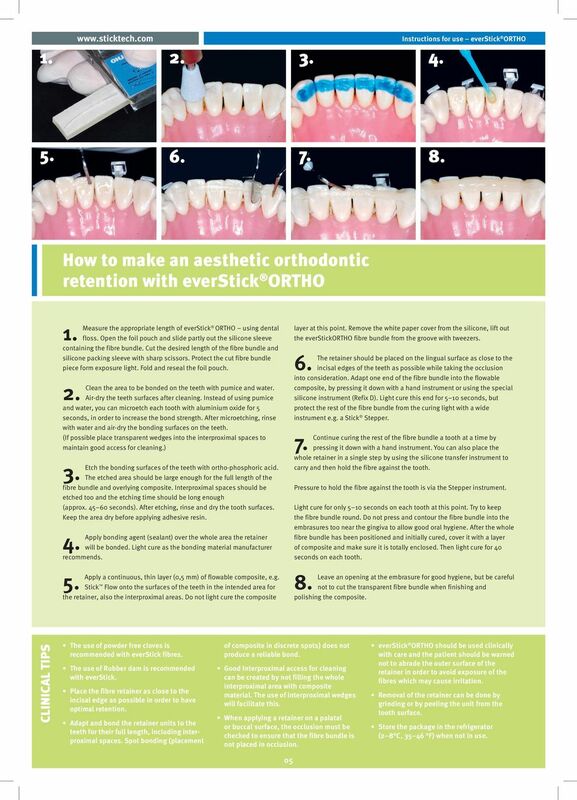 Measure the appropriate length of everstick A&O using dental floss. Open the foil pouch and slide out the silicone sleeve containing the fibre bundle. Place the measuring floss on the sleeve. Cut the desired length of fibre bundle and silicone packing sleeve with sharp scissors. Protect the cut fibre bundle piece from exposure to light, e.g. under a light shield. 2. Clean the area to be bonded on the teeth with pumice and water. Air-dry the teeth surfaces after cleaning. Instead of using pumice and water, you can microetch each tooth with aluminium oxide for 5 seconds, in order to increase the bond strength. After microetching, rinse with water and air-dry the bonding surfaces on the teeth. 3. Etch the bonding surfaces of the teeth with ortho-phosphoric acid. The etched area should be large enough for the full length of the fibre bundle and overlying composite. Interproximal spaces should be etched too and the etching time should be long enough (approx seconds). After etching, rinse and dry the tooth surfaces. Keep the area dry before applying adhesive resin. 4. Place transparent wedges into the interproximal spaces to maintain good access for cleaning. Apply bonding agent (sealant) over the whole area the anchorage unit will be bonded to. Light cure as the bonding material manufacturer recommends. 5. Apply a continuous, thin layer (0,5 mm) of flowable composite, e.g. Stick Flow onto the surfaces of the teeth in the intended area for the anchorage unit, also the interproximal areas. Be careful not to fill the whole interproximal area with composite material, in order to maintain a good space for cleaning. Do not light cure the composite layer at this point. 6. Remove the white paper cover from the silicone, lift out the everstick A&O fibre bundle from the groove with tweezers. Adapt one end of the fibre bundle into the flowable composite, by pressing it down with a hand instrument or using the special silicone instrument (Refix D). Light cure this end for 5 10 seconds, but protect the rest of the fibre bundle from the curing light with a wide instrument e.g. a Stick Stepper. Continue curing the rest of the fibre bundle either a tooth at a time by pressing it down with a hand instrument or silicone instrument. Light cure for only 5 10 seconds on each tooth at this point. Try to keep the fibre bundle round. 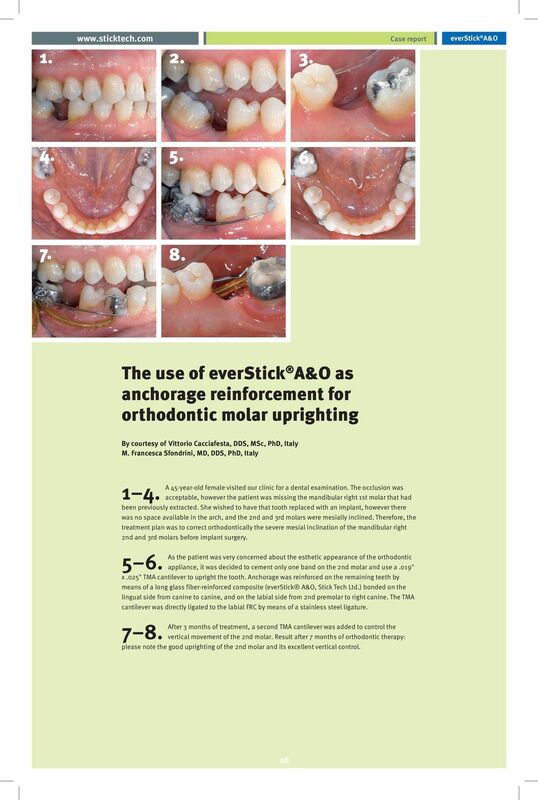 Do not press and contour the everstick A&O fibre bundle into the embrasures too near the gingiva to permit good oral hygiene. 7. 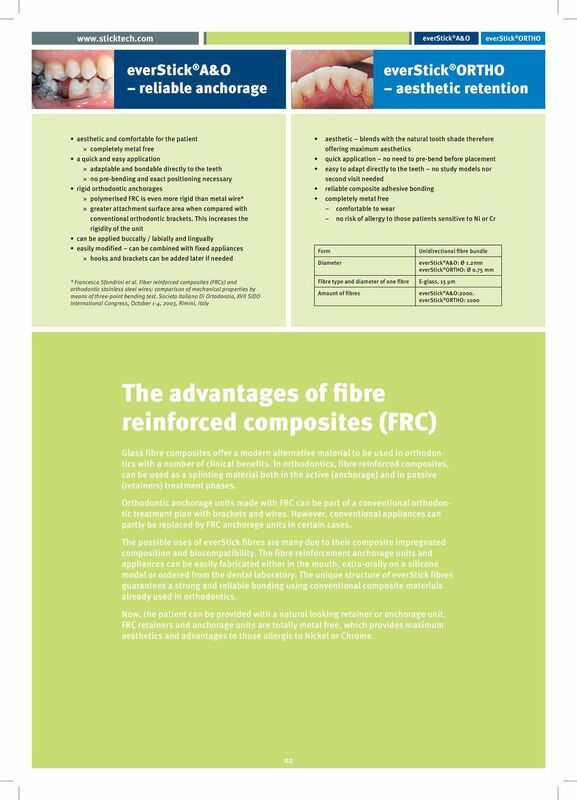 After the whole fibre bundle has been positioned and initially cured, cover it with a layer of composite and make sure it is totally enclosed. Then light cure for 40 seconds on each tooth. Leave an opening at the embrasure for good hygiene, but be careful not to cut the transparent fibre bundle when finishing and polishing the composite. 8. Brackets, tubes or hooks must be bonded to the anchorage unit either at the same time as the whole anchorage is light cured (see above) or separately. In case brackets, tubes and hooks are bonded on to the polymerized anchorage, the surface of the anchorage needs to be roughened with a diamond burr. Brackets, tubes or hooks should be bonded on to the anchorage as recommended by the manufacturer. When metal brackets, tubes and hooks are used sandblasting and silanization is recommended for the bonding surface. 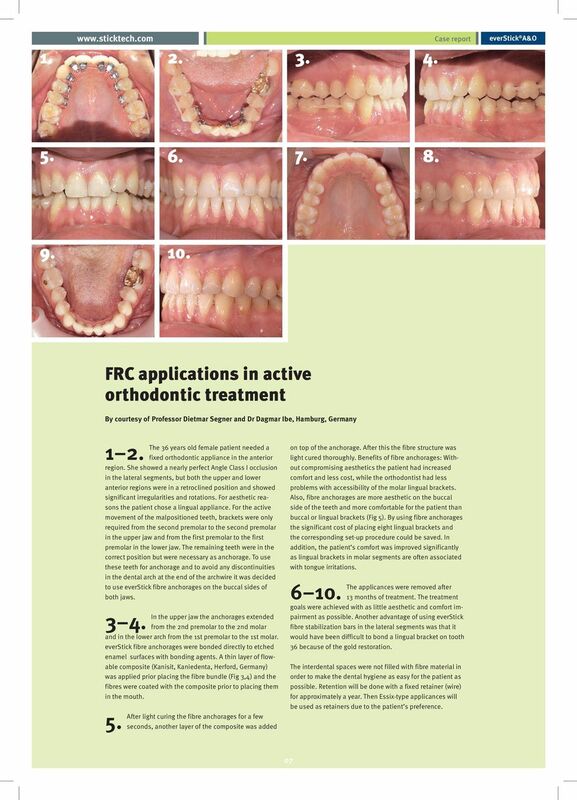 After final polymerization and finishing the FRC anchorage unit can be used for performing the desired tooth movements. 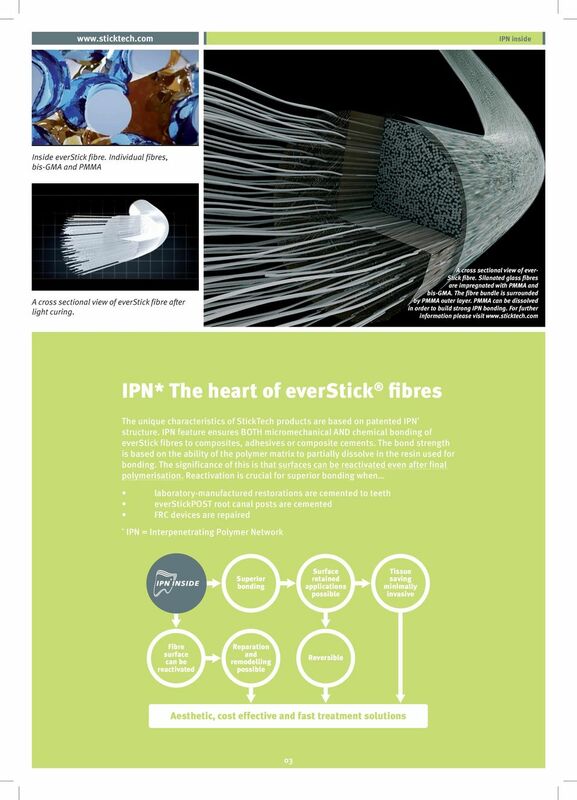 CLINICAL TIPS The use of powder free cloves is recommended with everstick-fibres. 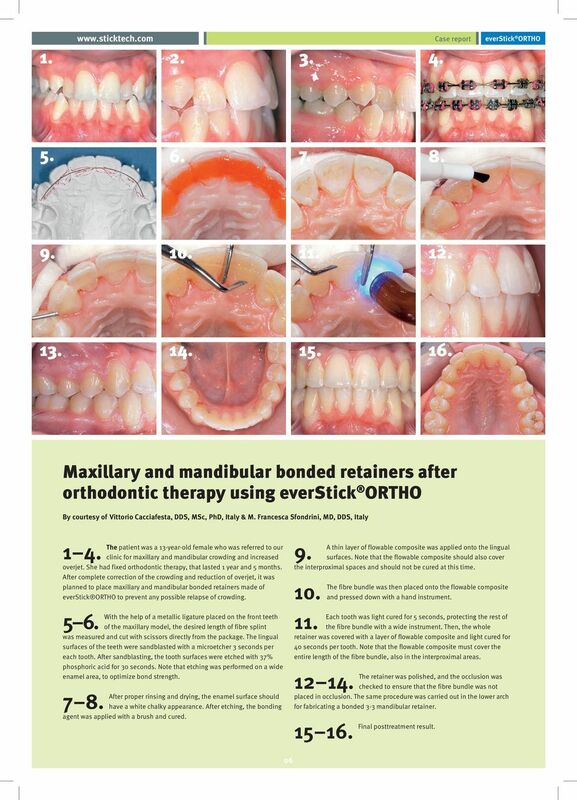 The use of Rubber dam is recommended with everstick. Adapt and bond the anchorage units to the teeth for their full length. Cover the whole anchorage and interproximal areas with flowable composite. Placement of spots of composite does not produce a reliable bond. Interproximal spaces should be shaped to facilitate good oral hygiene, e.g. with Interproximal brushes. If necessary flatten the fibre bundle to get large enough bonding area for tubes, brackets or hooks. When stronger fibre anchorage is needed, two or more fibre bundles may be used. If the fibre anchorage is bonded to the material other than natural tooth please follow the specific bonding procedure for 04 each material. 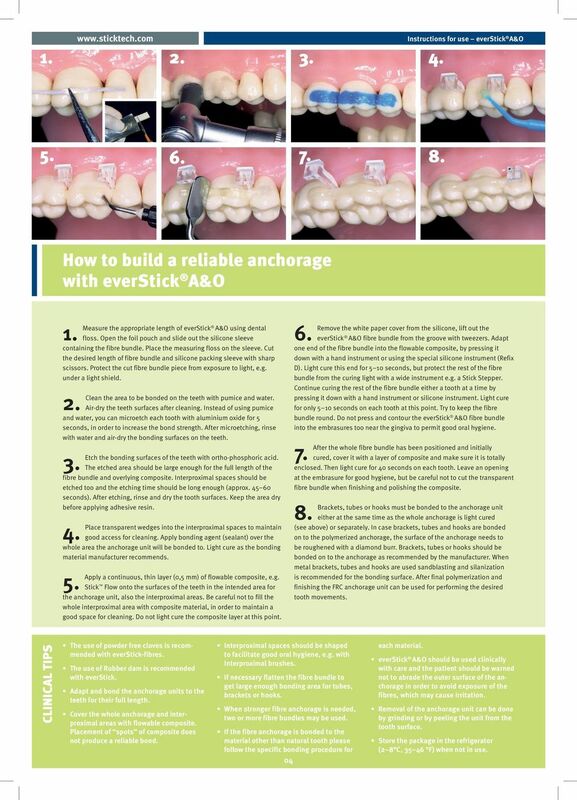 everstick A&O should be used clinically with care and the patient should be warned not to abrade the outer surface of the anchorage in order to avoid exposure of the fibres, which may cause irritation. Removal of the anchorage unit can be done by grinding or by peeling the unit from the tooth surface. Store the package in the refrigerator (2 8 C, F) when not in use. 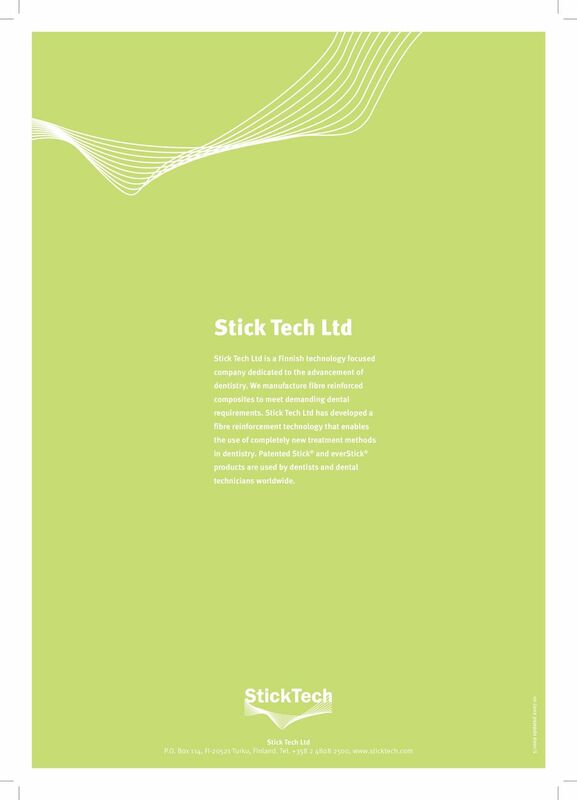 Stick Tech s fibre reinforced treatment options. Do you have loose or missing teeth? BASIC ORTHODONTICS And why we believe in THE TIP EDGE TECHNIQUE (Differential Straight Arch) MOVING TEETH Light force + Time = Tooth Movement Any technique of moving teeth involves light force and time. 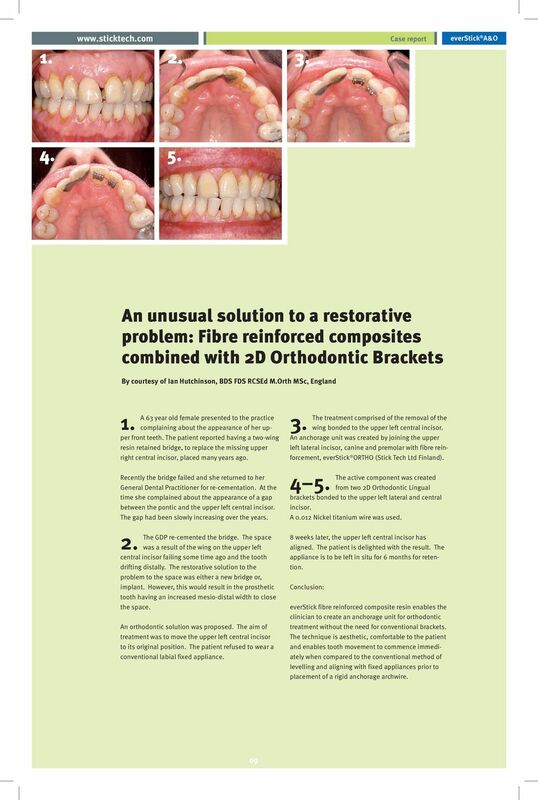 Periodontal Consideration Before and After Orthodontic Treatment Tsung-Ju Hsieh, D.D.S., M.S.D.